"Sing Enochian songs for me, Wolf on Sirius! " 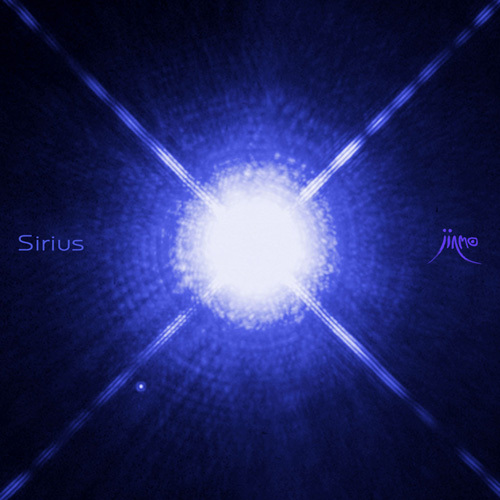 Sirius is the next brightest star in the night sky from Earth. What the naked eye perceives as a single star is actually a binary star system, consisting of Sirius A and Sirius B.
Sirius is known as star reflecting its prominence in its constellation, Canis Major. you could draw an inference that "Sirius" is significant star to him. JINMO also sympathize with these three animals; wolf, raven and rabbit. And he describes it as "Courage of wolf, inspiration of raven, love of rabbit (affection of rabbit)". In many ancient cultures, people used some metaphorical phrases such as moon is metaphors for rabbit, and sun is for raven. JINMO had composed "Eternal Moonbeam On Elysium" dedicated to rabbit the moon, "Requiem For Sun" to raven the sun. And the star coresspond to the last one, Wolf, is "Sirius". "Sirius" is the epic JINMO had been composed since late last year. "Sirius B" is characterized by quite unusual drones, JINMO refers to the drones as "particle drones". which is electric-shock like quite unique drones including ultrasonic. "Sirius A" is also composed to occur binaural beat, and this is occured by quite heavy low frequency drones. These drones are out of range with built-in speaker system on iPhone or laptop computer. This album "Sirius" features binaural beat, we recommend listening with headphones for high quality listening experience. And on "Sirius A", I felt myself intermingled with things, a whole things around me and reassembled to new one under the influence of strong gravitation in the universe far, far away. It was a very beautiful, mysterious experience." Enjoy the beautiful, mysterious songs by the wolf on Sirius.